Note : Uninstalling the software will not remove the activation code and validity. Start Net Protector 2018, In the Dashboard Tab, click on Validity Info. In Validity Information screen click on Reset Unlock Code. Click Yes to confirm. Click on Exit and then restart PC or Exit the Red Tray icon (magnifier). 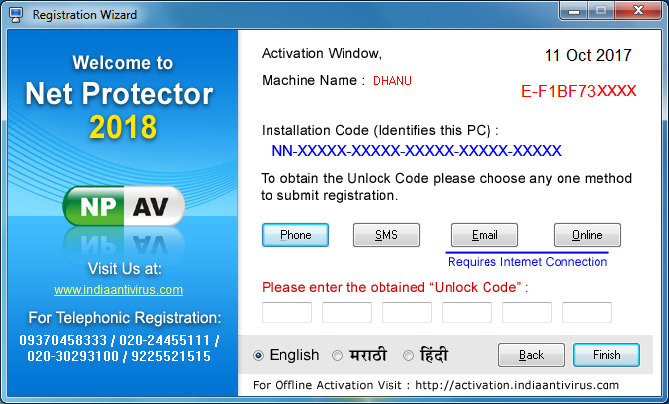 Now double click on Net Protector 2018, You will see a message no activation code is entered and Registration Wizard will come up. Fill in the correct Key Number (the new one, E-10characters) and enter all the correct details and click on next on each screen. When you purchase a Net Protector Key, you will receive a separate Key number for each PC. Use 1 Key on 1 PC and make a note of the Machine Name against the Key number. (e.g. : HR-D955-233B-9AB2-A4AC-06C2) This code identifies the PC on which you are installing NPAV. If your PC has internet connection, you can click on Online Button and the software will be activated for this PC. 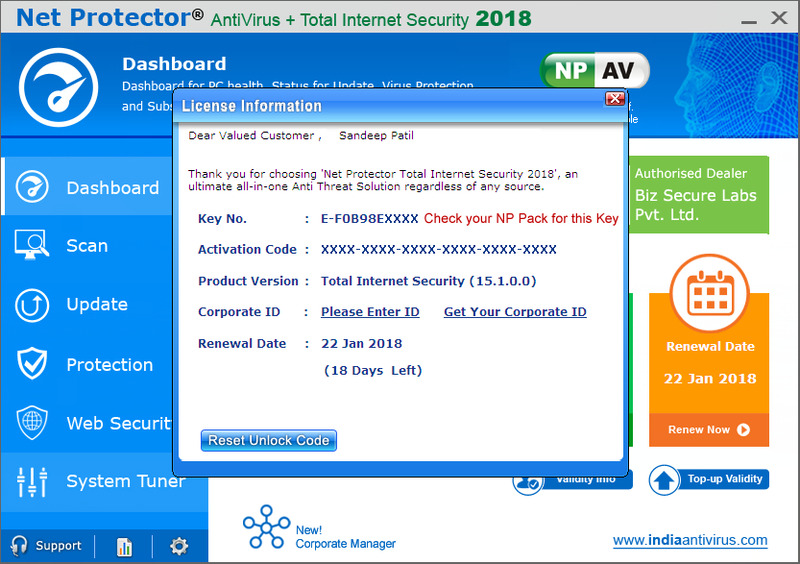 Send this information to help@npav.net / sales@indiaantivirus.com and we will email you with the “Unlock Code” for your PC. Please make a note of the Key Number, Unlock Code pairs for the respective Machine Names. Do not interchange / exchange these codes or numbers. In case you format / re-load your OS or re-install NPAV, the same Unlock Code will be still applicable for that PC.